This might sound like odd advice, but it’s crucial for new songwriters to be kind to themselves. Unless you’re a songwriting savant, the first thing you write probably isn’t going to be anything special and, in fact, it might be just plain bad. Rather than feeling bad about it, approaching the writing process with bravery and curiosity will help make sure your first songwriting effort is a great experience. Since you’re new, everything about songwriting is uncharted and filled with limitless potential. Instead of setting out to become the world’s next pop star, scaling expectations back will keep you from getting discouraged and bailing on your first song before it gets finished. A centered and gracious attitude isn’t typically associated with songwriting greatness, but it can help new writers make music and stick with it. Finishing what you start in music is essential, especially if you’re inexperienced. Songwriters sometimes don’t finish their songs because they bail on ideas too early or because they don’t think the finished result of their work will be any good. But when it comes to your first song, you should make every effort to turn your idea into a complete recorded demo. There’s a few reasons why this is so important. First of all, hearing the beginnings of a musical idea isn’t the same thing as listening to a complete song. 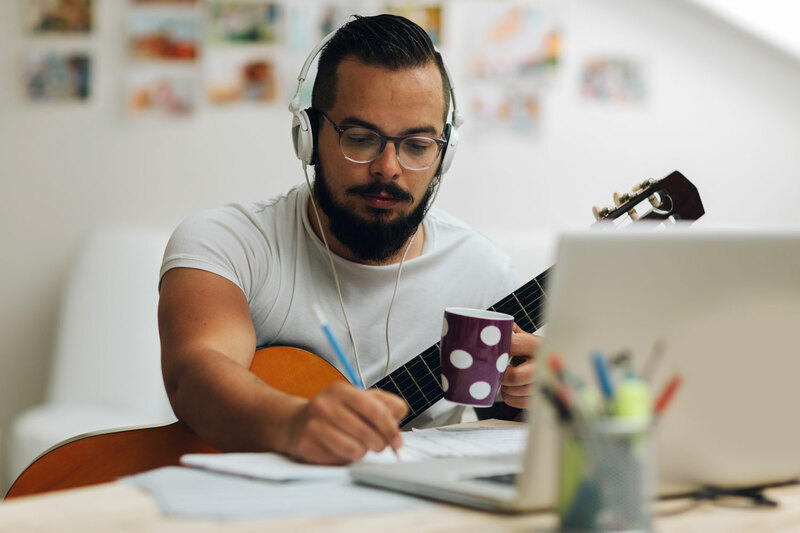 Getting in the habit of finishing your songs is a good idea to think about early on in your songwriting practice because if you don’t, you might end up never finishing your songs. Second, recording demos of your completed songs will give you the perspective you need to develop as a songwriter. I’ll often write and record something thinking I’ve just made something great and will listen back a day later with the opposite opinion. Recorded demos are not only references but also important completed representations of your work. To get the most out of writing your first song, you should take note about what’s successful in your process and what needs work. This sort of reflection should happen during the writing process and when your first song is finished. If there’s a lyric, melody, or chord progression you don’t like, figuring out why will help you avoid repeating the same mistakes in the future. And conversely, identifying what’s good about your first song will help you further develop your process and style. One last thing to keep in mind is that making music can be hard for writers at every level. If you’re experimenting with music for the first time and get far enough to actually write and record your own song, then you’re already succeeding in a big way.